Bu Bu Jing Xin 步步惊心 (also known as Startling by Each Step) is a new 35 episode time-traveling drama starring Liu Shishi, Nicky Wu and Kevin Cheng. Liu Shishi, a 25 year-old modern day woman woke up from a car accident to find herself in the body of a 16 year-old Manchu girl living in the 18th century Qing Dynasty. In her new life, she became deeply entangled in Aisin Gioro princes’ battle for the throne. 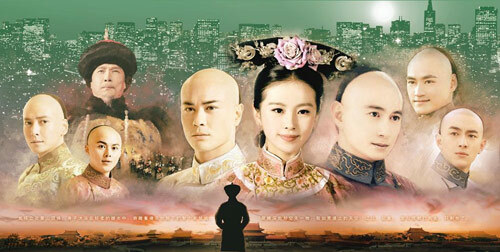 The drama’s theme song “One Persistent Thought” Yi Nian Zhi Zhu 一念執著 is a duet between Hu Ge and Alan Dawa Dolma. Hu Ge has sung many songs for his dramas such as “June’s Rain” (Chinese Paladin), “Forgetting Time” (Chinese Paladin 3), “Dare to Love” (Fantasy Zhu Xian) and many more. He has also sung is the theme song for “Strange Hero Yi Zhi Mei”. You can download his albums here. Alan Dawa Dolma (professionally known as Alan) is a female Tibetan-Chinese singer active in the Japanese music industry. Alan’s surprised the Chinese audiences with her divine voice when she sang the themes for Red Cliff and Red Cliff 2.